It used to be that when it came to dog tags for pets everybody got pretty much the same thing. They were all more or less run-of-the-mill round tags with your basic info on them, nothing much to look at. Over the years, that’s all changed. Now, you can get dog tags for pets in all shapes and sizes, from basic to bling. They’ve even got pet tags bedazzled with Swarovski crystals so your pet poodle or Chihuahua can mince around like Zsa Zsa Gabor back in the day or Mariah Carey now. 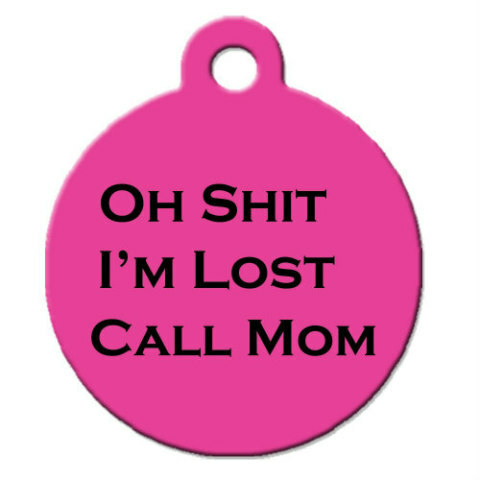 Besides pet stores that carry a fairly decent variety of their own anymore, really cool custom pet tags can be found now at places like Etsy, where you can basically order whatever you want. The selection at pet stores has definitely increased and improved in recent years. The larger box stores usually have engraving machines on hand so you can have all your information applied to the tags then and there, instead of mailing them off and waiting for them to return. Pet ID tags in the shape of a dog bone are super popular sellers at these places, but they also carry heart shapes, along with fish, fire hydrants, skull and crossbones, basic circles and squares and even paw shapes. 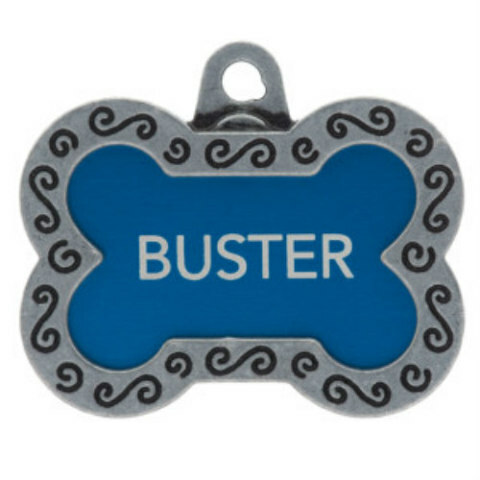 Most are made from varying metals, but they carry the hard plastic pet tags as well, in case the clanging or jingling noise drives you crazy. 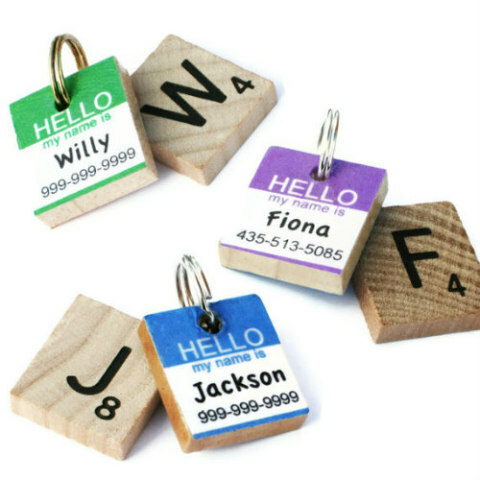 Speaking of jangling your nerves, if the sound of dog tags clinking together for hours on end truly does drive you crazy, skip the name and home information tags altogether and go with pet nameplates instead. They’re smooth and low profile and attach directly to the outer surface of a dog collar, so they lay flush and can’t get caught on anything or make noise. 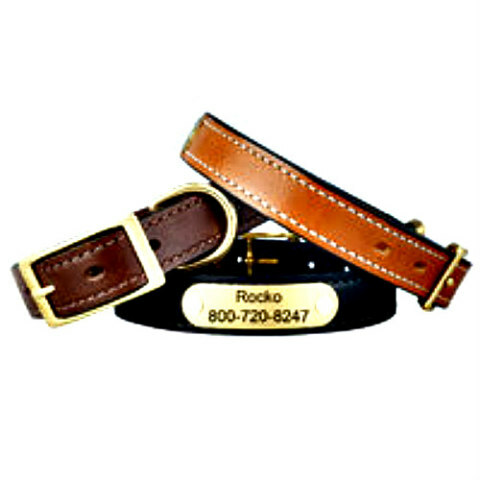 If you want to get the whole kit and caboodle at once, you can get personalized nameplate dog collars at places like DogIDs.com. These dog collars feature solid brass nameplates and hardware mounted on English bridle leather with personalized engraving on the tag. 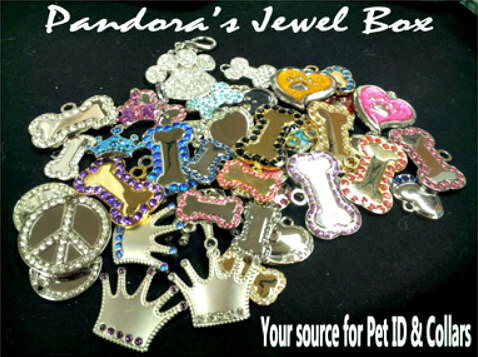 Another choice is slide-on pet ID tags that resemble buckles. They’re sturdy and guaranteed to stay on unless you undo the collar and slide them off. So you want to get blingy with it? No problem. Bling dog tags are everywhere. You can go to Amazon right now and find a whole selection of dog tags for pets embedded with Swarovski crystals and get matching collars to boot. Pet-Tags.com has probably got a better selection, if you really want your pet tags dripping in them, though. They look a little higher end. But if you’re looking for something really awesome with perhaps more of a charm look to it and make a statement about mommy or daddy’s little boy or girl, then hands down you’ve got to visit Pandora’s Jewel Box. Their pet ID tags run from adorable to beautiful, tasteful to ostentatious. Bling is their thing. For game lovers and intellectual types there are pet tags in the form of fun little Scrabble tiles from ScarlettandCo or jigsaw puzzle pieces (also on Etsy) that you’re not likely to see on every other mutt at the dog park. 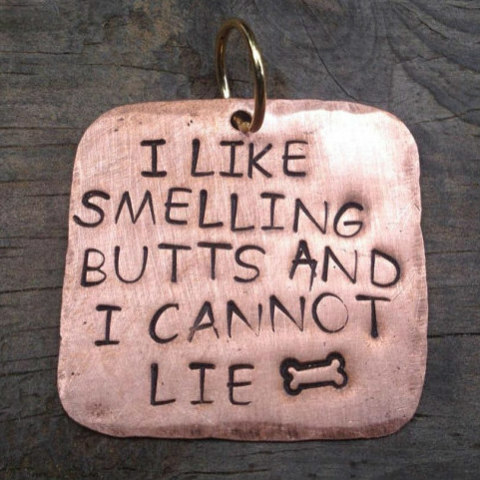 All in all, there is no reason your pet has to go around through life wearing a boring, ordinary pet tag anymore. Remember, life is short, especially for pets, so let them live it to the fullest with as much panache as you can muster for them, 'cuz they can’t do it themselves.